Welcome! By scrolling around our Minneapolis Neighborhood Maps you'll be able to find certain neighborhoods that we have created, they will noticeably light up green when you hover over them. Our Minneapolis Neighborhood Maps provide you with valuable information about MPLS Neighborhoods & the buildings & apartments found within. 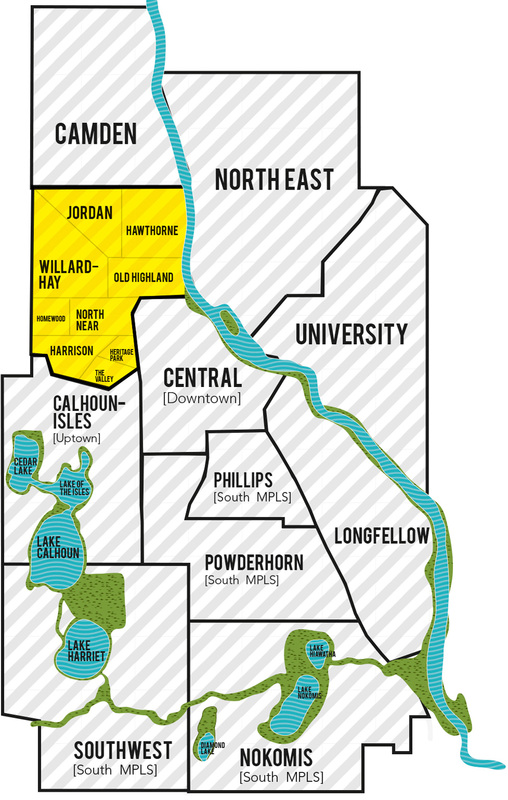 Camden is a community in Minneapolis, covering the upper half of the north side. Its boundaries are 53rd Avenue North to the north, the Mississippi River to the east, Lowry Avenue North to the south, and Xerxes Avenue North to the west. The Camden and Lowry Avenue bridges connect Camden to Northeast Minneapolis. 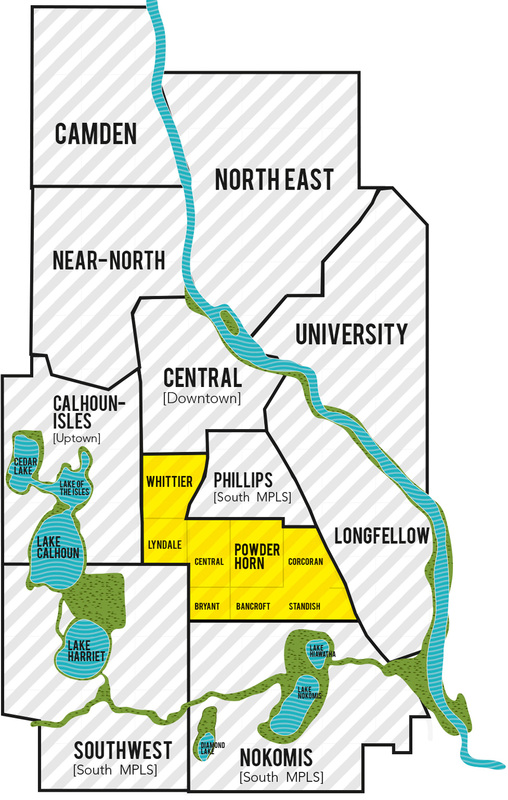 The combination of Near North and Camden is often referred to collectively as "North Minneapolis" and oftentimes "NoMi", following a "Get to NoMi" community public relations campaign. It is impossible to describe the classic charm and character of Minneapolis without discussing the Northeast neighborhood. Once known for its industrial atmosphere, the area has changed drastically over the past few decades. Yet, Northeast still manages to hold onto its residential, low-key charisma while allowing itself to get sprinkled with quirky bars, art galleries, scenic walks and restaurants. Northeast is home to several annual events, including the Third Ward NeighborhoodFest, Canadian Pacific Railway’s Holiday Train event, Oktoberfest at Gasthof Zur Gemutlichkeit and the world-famous Art-A-Whirl art crawl. Appearing year after year on City Pages’ “Best Of” list for its unique restaurants, down-to-earth nightlife and living in general, Northeast has proven itself a neighborhood worthy of any “Best Of” list. The trendy and vivacious Uptown is balanced out by the peaceful surroundings of Lake Calhoun and Lake of the Isles. 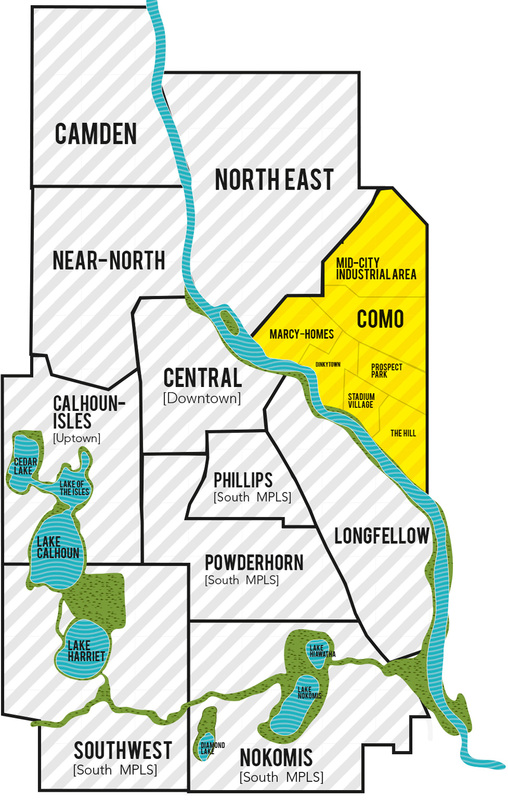 The Grand Rounds Scenic Byway intertwines with the Chain of Lakes Regional Park and connects to several smaller neighborhood trails and the well-travelled Midtown Greenway. 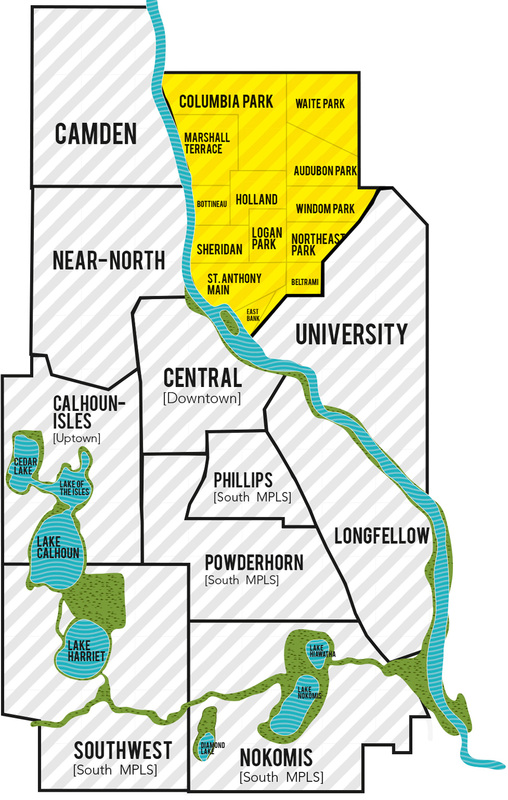 The main lakes in the Calhoun Isles area are Lake Calhoun, Lake of the Isles, Lake Harriet and Cedar Lake. Many channels allow travel between the lakes, while bicyclists, joggers, walkers and rollerbladers enjoy the extensive network of paths surrounding the lakes. In the winter months, the lakes are used for skating and ice fishing. Two major events happen every year in Uptown. The world-famous Uptown Art Fair takes place every August and thousands of artists converge on Uptown to exhibit and sell their art. The Uptown Bike Race is held each June and also draws crowds from all over the world. Many of the neighborhoods in this community also take part in the Palio festival and parade held in Kenwood Park each fall. The expansive and largely commercial community of Central Minneapolis contains most of downtown and the central business district. 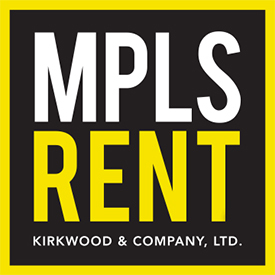 Downtown East, Downtown West, Elliot Park, Loring Park and the North Loop are located here. Located smack-dab in the middle of Minneapolis, this brilliant community is alive with art, commerce, recreation, nightlife – basically anything the heart desires is located in Central. All of the city’s major venues are located in the Central Community: the Minneapolis Convention Center, the Metrodome, the Target Center, the IDS Center, the Mill City Museum, The Foshay Tower Observation deck and Museum, Target Field, the Stone Arch Bridge and the Guthrie Theater are only just a few sites on a long list of attractions that bring people to this community. The Light Rail provides a direct link from downtown straight to the Minneapolis - St. Paul International Airport and the Mall of America. Downtown Minneapolis also provides easy access to most major interstates. University is a neighborhood that is exactly like what it sounds like; a community that is almost completely occupied by the University of Minneapolis campus. 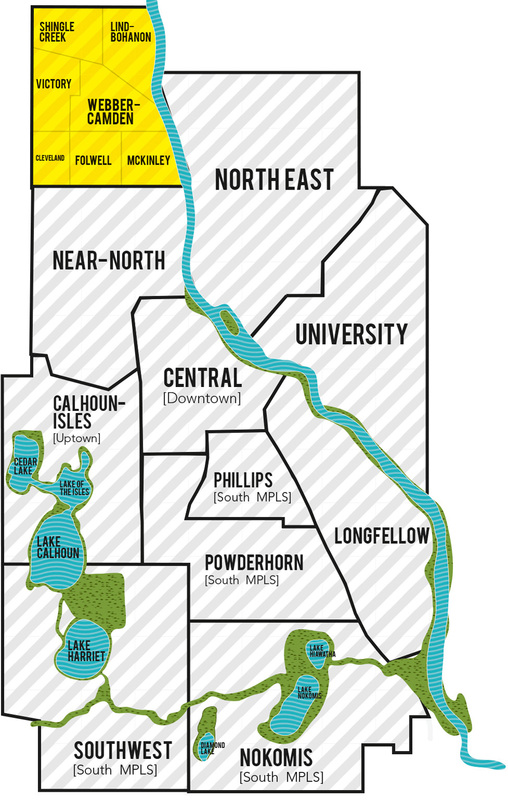 Despite the fact that the Mississippi River is such a dominant force in Minneapolis and neighboring St. Paul, University is actually the only neighborhood in Minneapolis that exists on both sides of the river. These two sections are known and the East Bank and the West Bank. University has been a progressive community for decades, mostly because of the young population who live here, but also because of its close proximity to the downtown Minneapolis area. Many students live here, and the community is filled with affordable housing, restaurants, bookstores, theaters and coffee shops. Some notable establishments are the Bell Museum of Natural History, Weisman Art Museum, Cedar Riverside People’s Center and Minnesota Centennial Showboat in the summer months. Powderhorn is lively urban community made up of eight neighborhoods, including Whittier, Corcoran and Bryant. It stretches from I-35W to Highway 55/Hiawatha and from Lake Street down to 42nd/ 43rd Street. Powderhorn is a community notorious for its creativity and strong community spirit. At the center of this neighborhood is Powderhorn Lake and Park, which host many family-friendly events all year round, including the May Day Parade in the spring and the Powderhorn Art Fair. This massive park is centrally located and offers playing fields, a community center and fireworks for the 4th of July in the summer. The rejuvenated Lake Street is home to many local businesses and the restored Sears Building complex that is now the Midtown Exchange. Nicollet Avenue has recently become the premier strip for cuisines from around the world. Known as “Eat Street,” this multicultural stretch includes many new restaurants as well as longtime local favorites, like the Black Forest Inn, Little Tijuana and the Bad Waitress. Just off Eat Street are many local, signature neighborhood establishments such as May Day Café and Matt’s Bar, which is home to the world-famous Jucy Lucy and was featured on Man v. Food and Food Wars. The Phillips Community is a diverse community with many nationalities located south of downtown Minneapolis. It extends from Interstate 94 on the north to Lake Street East on the south and from Interstate 35 on the west to Hiawatha Avenue on the east. The eastern border continues along Hiawatha to Cedar Avenue South and then along the Soo Line railroad. The neighborhood and its junior high school take their names from Wendell Phillips, a 19th century abolitionist. Longfellow There are five smaller neighborhoods that make up the very distinctive community of Longfellow: Cooper, Hiawatha, Howe, Longfellow and Seward. Longfellow is named after the American poet Henry Wadsworth Longfellow, who incorporated elements into his poem The Song of Hiawatha. Like many communities in South Minneapolis, Longfellow also contains several parks, lakes and Trails. Longfellow has four unique boundaries: the Minneapolis Midtown Greenway, a bicycle and pedestrian trail, to the north, the beautiful Mississippi River Gorge to the east, Minnehaha Falls to the south and the Hiawatha Light Rail line to the west. The homes in Longfellow are typically bungalow-style homes built in the 1920s. Now grain silos and factories along the length of Hiawatha are set to make way for new residential condos and apartment buildings. Establishments that are big draws the community are the recently opened Elevated Beer, Wine & Spirits store and The Blue Door Pub as well as staples like The Longfellow Grill, The Rail Station, Fast Eddie’s Pizza and The Riverview Café. 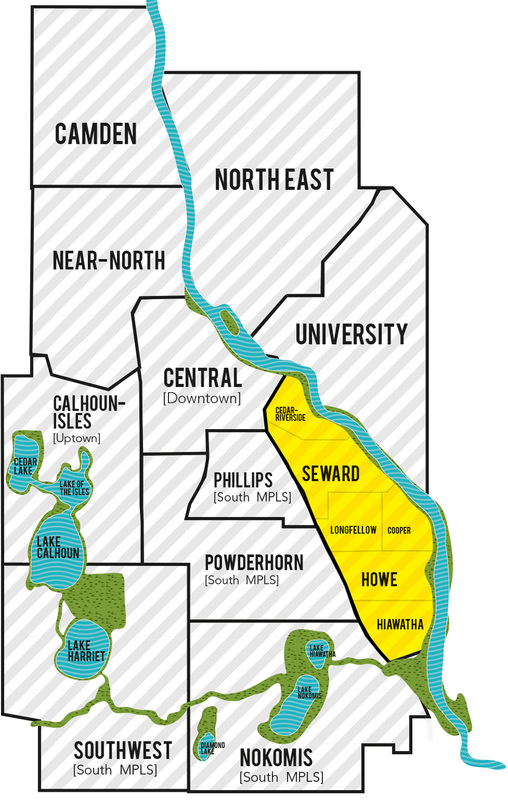 Southwest is a largely residential community located in the southwestern corner of Minneapolis. 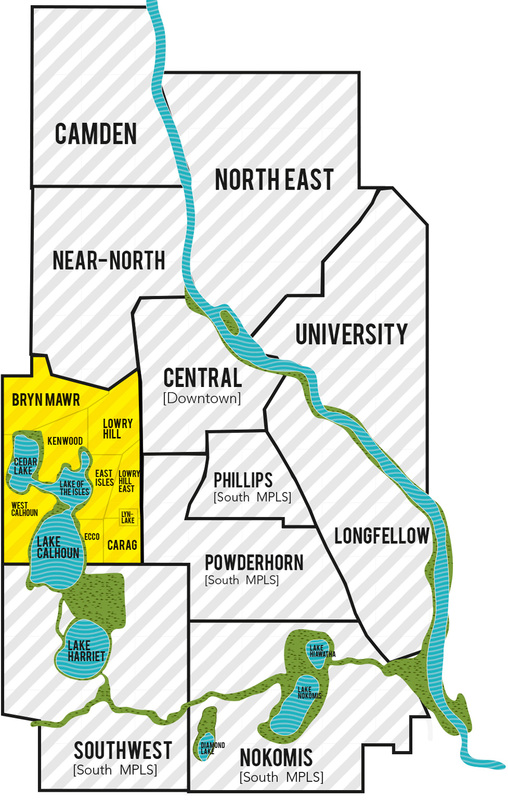 Southwest offers the quintessential Minneapolis lifestyle, complete with something for everyone in the family: Close proximity to shopping, restaurants and access to major freeways, while being nestled in the middle of trails and parks along several lakes and Minnehaha Creek. 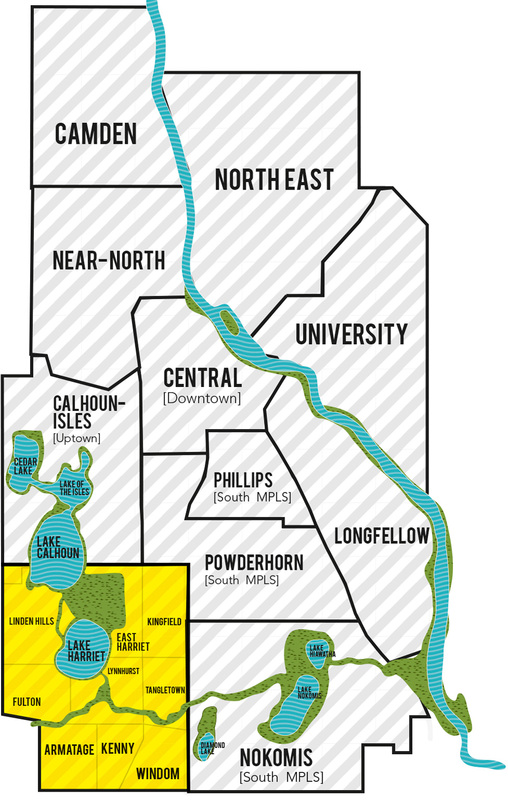 Southwest is a true reminder of why Minneapolis is nicknamed the “City of Lakes.” Lake Harriet is in the center of Southwest and is part of the hugely popular Chain of Lakes. The Lake Harriett Bandshell is a big draw, especially in the summer months where it features a rigorous schedule of jazz, folk and rock concerts. The Minneapolis Park and Recreation Board hosts the “Movies in the Park” and the “Concerts in the Park” series, which offer over 250 free outdoor concerts and movies at various locations, including the Lake Harriet Bandshell, Minnehaha Park and Father Hennepin Bluffs Park. There is fun to be had in the Southwest community in the winter as well. The Lake Harriet Winter Kite Festival is held every January. Kites fly over the frozen lake while other family activities include ice fishing, horse-drawn wagon rides, snowshoeing and a marshmallow roast. Nokomis is another primarily residential community in South Minneapolis. It is comprised of 11 neighborhoods south of 42nd/43rd Street and between 35W on the west and Highway 55/Hiawatha on the east. Nokomis has many community offerings, such as the Hiawatha Golf Course, Lake Nokomis Park and Community Center, and several parks, trails, gardens and recreational fields. The Hiawatha Light Rail, Minnehaha Parkway and Lake Nokomis are other key features. Minnehaha Creek flows through the various Nokomis neighborhoods of south Minneapolis as it works its way toward Minnehaha Falls and the Mississippi River. Lake Nokomis is alive with ice skaters and hockey players in the winter and sailors and swimmers enjoying the public beaches in the summer. In keeping with the natural and community-oriented feel of Nokomis, there are several public gardens, including the Nokomis Naturescape Gardens, which are located on the northeast shore of Lake Nokomis, and the Nokomis East Gateway Gardens. Tree-lined blocks with small houses in a variety of architectural styles are characteristic of this area. Though there are several apartment complexes in Nokomis, quaint homes on small lots are the most common type of housing found in Nokomis.